For those of you who have already experienced the pleasure of driving a Bounder with Bilstein shock absorbers installed, please be patient with me. We recently travelled to Florida to an International Rally and prior to making the trip I had carefully considered buying new shocks. 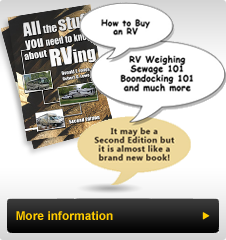 I searched the web and had determined the best price and I thought that I would see if a good deal could be made at Camping World while at the Rally. I did not look forward to doing the work myself since my Bounder was equipped with the original Ford shocks which were over eight years old, we have no levelling jacks and the bottom had been coated many times with wet rustproofing. As we travelled south we noted how much rougher the roads seemed, and how jarring the road joints were. The defining moment occurred as I rounded a curve on I75 in Knoxville, hitting a pothole big enough to swallow the coach and entered into construction with a variety of lane re-alignments. As we rounded the corner the fridge door flew open and much of the contents of the fridge landed on the floor, including ten eggs. My wife Jane jumped into action and it is safe to say we both were walking on eggshells, she in reality and I figuratively, since I was the last one to close the fridge. With no place to pull over, we drove as she cleaned up the "yucky" slimy mess. I decided after the rally to deal with the shocks. Fortunately one of the Rally Vendors both sold and would install new Bilstein Shock absorbers and after chatting with another member of our chapter, I elected to install them. One original front shock when held and extended vertically fell without any resistance, another required two fingers of pressure. The right rear shock had nominal resistance (it is mounted on the "heavy" side of our Bounder, and the remaining shock was weak but at least it popped back up when compressed. The installer spent close to one half hour attempting to loosen one bolt that took more than 630 foot pounds of torque to loosen. Fortunately he was able to use a long lever on a bar to break loose the seized bolt that defied his air gun. We did not leave the grounds until five days later, but the improvement was immediately obvious. The leaning that we experienced when leaving a campsite was gone, tar strips were seen, heard but not felt and the coach was far less susceptible to swaying caused by passing trucks. The Bounder once again was level. Both Jane and I noticed a reduction in steering correction and a return to a comfortable drive. My discussions with the Bilstein Representative indicated that if you have a coach over four years old or over 30,000 miles, your shock absorbers are likely due for replacement. There was no obvious leaking on my original shock absorbers, however they were coated with rustproofing so a visible oil leak would have been hard to detect. I now know that these shocks were well past the point of replacement and in fact my coach was unsafe. Without any doubt, the improvement in ride and handling far outweighed the cost to upgrade. The stories you have heard about Bilstein shocks, seem to be born out if our experience is any example.